Do you drive a car or ride a bike? Windscreens and visors end to get extremely filthy especially visors. Moreover in adverse conditions the weather and elements can obstruct visibility. 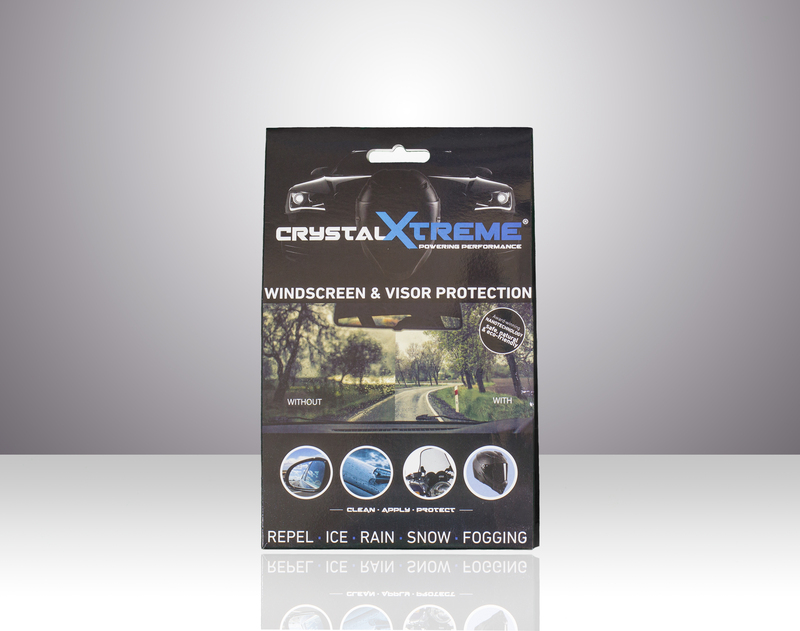 CrystalXtreme® Windscreen & Visor Protection System is a nano-coating designed to protect your windscreens and visors to make them easy to clean and enhance visibility. The superphobic CrystalXtreme® layer makes the surface extremely slippery and water just shoots off when driving at higher speeds. It is especially great for people who spend a lot of time on the road driving or riding. Step 1 : CLEAN – After ensuring that the surface is clear of any large dirt particles or other substances remove the Biosativa microfiber cloth contained in the sachet (Sachet step 1). Apply the Biosativa evenly across the entire surface area and continue to apply until the area is completely clean. Once cleaned, bu the surface dry using the microfiber towel provided in the pack and continue until the surface is completely dry. Note: it’s essential that all dirt, grime, fingerprints and any other oil or dirt deposits are removed before moving to the next step. Step 2 : APPLY – Remove the CrystalXtreme® Pre-Treatment microfiber cloth contained in the sachet (Sachet Step 2) to pre-treat the surface. Apply the pre-treatment evenly across the entire surface and continue to apply until the microfiber cloth is completely dry. Ensure that the entire surface area is pre-treated. Note: this process will take anything between 2 and 4 minutes to complete depending on the size of the surface and the atmospheric conditions. Do not attempt to remove any smearing for a minimum of 30 minutes after completing the application. Step 3 : PROTECT – After pre-treating ensure that the surface is completely dry and remains free of any dirt, grime, fingerprints or any other oil or dirt deposits. Any soiling remaining on the surface will adversely react the level of protection attained. 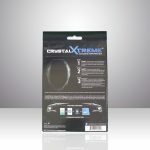 Remove the CrystalXtreme® microfiber cloth contained in the sachet (Sachet Step 3). 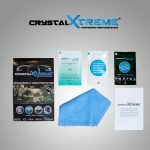 Apply the CrystalXtreme® protection evenly across the entire surface and continue to apply until the microfiber cloth is completely dry, ensure that the entire surface has been coated with CrystalXtreme®. Note: this process will take anything between 2 and 4 minutes to complete depending on the size of the surface and the atmospheric conditions. Once completed, the surface may show signs of smearing – this is normal during the drying/curing stage of application. After completing the entire procedure the surface will be touch dry within approximately 5 minutes. 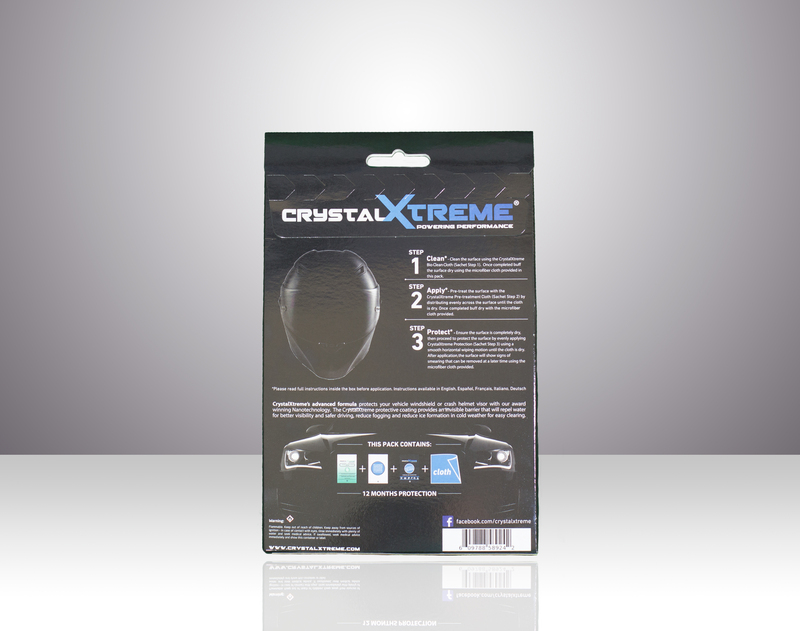 We recommend allowing a 12 hour curing time for the CrystalXtreme® layer to form. If you need to remove the smearing before 12 hours has elapsed use the microfiber towel provided to lightly bu the surface to remove only the residue, do not use excessive pressure. Note: Because the best performance is achieved after several hours have elapsed we recommend that you coat the surface immediately before a period where it is unlikely to be handled. 1. If the surface you are coating is heavily soiled we recommend that you wash it with soap and water (preferably using a power washer) before starting the CrystalXtreme® application. 2. Do not apply CrystalXtreme® in direct sunlight or onto hot surfaces. 3. Do not apply CrystalXtreme® in the rain or in extreme humid/moist conditions. 4. Do not apply CrystalXtreme® when near a source of ignition, this includes smoking.